57-6135 with 59-2229 at Ft. Bragg - the last two U.S. Army U-1A Otter aircraft. 57-6135 of the Golden Knights Parachute Team. • 57-6134. United States Army. Delivered 29-Aug-1958. Designated U-1A. Initially allocated to 2nd Missile Command at Ford Hood, TX. Jan-1962. Atlanta Army Depot, GA. Role unknown. Mar-1962. 57th Aviation Company at Fort Sill, OK.
October 1963. It joined the Aviation Section at Fort Ord, CA. Nov-1963. 17th Aviation Company at Fort Ord, CA. June 1964, Otter Transition School at Fort Ord, CA. May-1971. Fort Bragg, NC, as an Operational Support Airlift aircraft. June 1972 Assigned to the US Army's Golden Knights Parachute Team, Simmons AAF Fort Bragg, NC. 12-May-1981. To Guthrie AAF., Fort Rucker, Alabama for storage (one of the last two Otters in US Army service. Circa 1993. Placed on display at the US Army Aviation Museum, Fort Rucker. Otter 283 was delivered to the United States Army on 29th August 1958 with serial 57-6135 (tail number 76135). It was delivered from Downsview to Fort Hood, Texas, one of four Otters delivered at this time to the 2nd Missile Command. By January 1962 it was in the Atlanta Army Depot, Georgia undergoing work, prior to assignment to the 57th Aviation Company at Fort Sill, Oklahoma in March 1962. It remained there until October 1963 when it joined the Aviation Section at Fort Ord, California. The following month it joined the 17th Aviation Company at Fort Ord and then in June 1964, the Otter Transition School at Fort Ord. In May 1971, 76135 left the West Coast and flew across the country to Fort Bragg, North Carolina, where it was based as an Operational Support Airlift aircraft. In June 1972 it was assigned to the US Army's Golden Knights Parachute Team, also based at Fort Bragg. 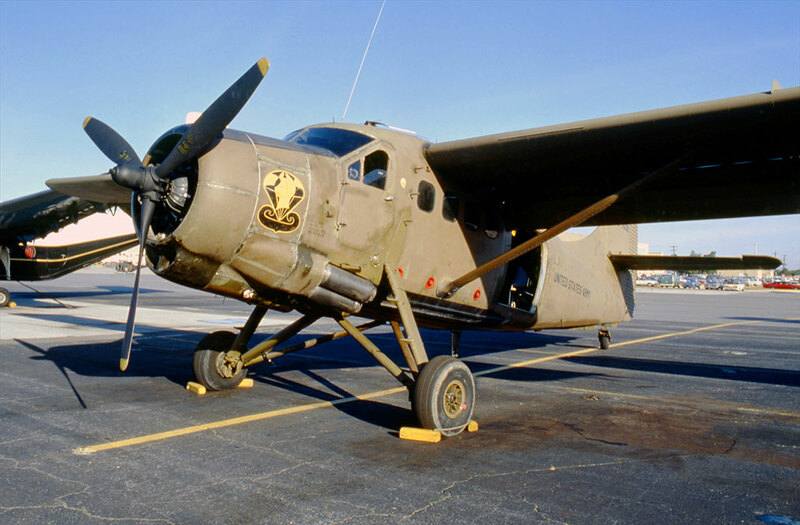 It served alongside 92229 (382) with the Golden Knights until April 1981 and these two Otters had the distinction of being the very last two Otters to serve the US Army. 76135 is mentioned in an incident report on 26th February 1975. During climb out from a landing strip, the engine chip light illuminated, resulting in an emergency landing but no damage. It was mentioned again on 18th May 1978 flying from Fort Bragg: “While on a jump pass over the Drop Zone at 10,000 feet, oil began blowing back over the windscreen. The jumpers exited over the DZ and the pilot started a let down. The oil pressure started fluctuating and dropping rapidly. Oil then completely covered the windscreen, causing the pilot to use the side windows for visibility. Landing was made without further damage”. 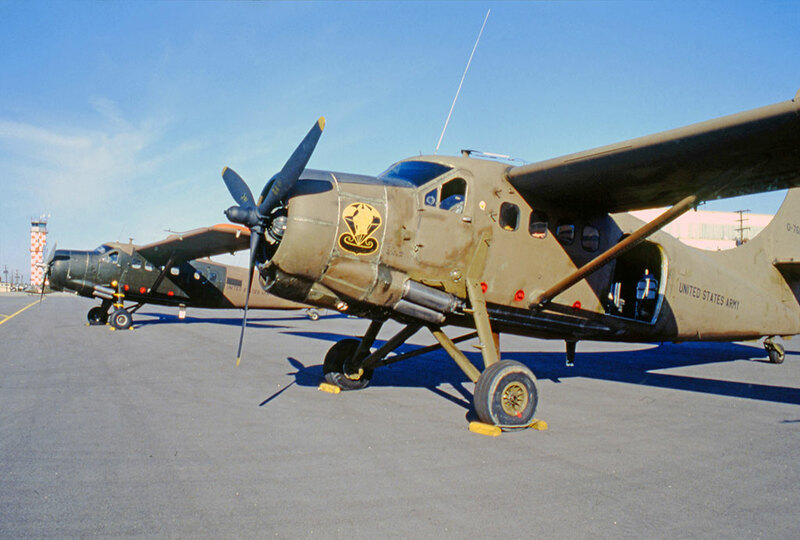 The two Otters, 76135 and 92229, were based at Simmons AAF, Fort Bragg, together with the Golden Knights Caribou and other aircraft. They were used exclusively by the Competition Team, which trained each day at a small airfield near Raeford, North Carolina. Occasionally the Otters were used as jump platforms at air shows when a helicopter or the Caribou was not available and the air show was less than an hour's flight from Fort Bragg. By November 1980, 76135 had accumulated7,298 hours on the airframe. The following year, the two Otters were replaced by two Beech U-21As with the Golden Knights. On 12th May 1981, an era came to an end when the two Otters took off from Fort Bragg for the last time and set off in formation, headed for retirement in Fort Rucker, Alabama. 92229 suffered engine trouble and could not complete the journey that day, but 76135 landed safely at Fort Rucker, where it was put into storage at Guthrie AAF. It was later joined there by 92229 when it eventually arrived. The US Army Aviation Museum is located at Fort Rucker and had an Otter on display, 76134 (284). This Otter remained on display in the Museum until 1993, when it was sold. It was replaced as the Museum exhibit by 76135, which has been painted in the white-red colour scheme and suspended from the roof of the museum. It is one of two Army Otters in museums, the other being 53270 (116), which is in the Army Transportation Museum, Fort Eustis, Virginia.